Antibiotic resistance is one of the biggest problems the humanity has to deal with today. Found in 20’s of the last century, antibiotics became one of the most important discoveries made by scientists. Antibiotics allowed people to resist such infectious diseases as dysentery, tuberculosis, typhoid fever and meningitis for many years. Specialists divide antibiotic resistance into natural and acquired types. The natural (primary) resistance is encoded in chromosomal genes of bacteria. It develops long before an antibiotic starts acting. This is an invulnerable bacterium, which has no cell walls. Therefore, some antibiotic drugs, the action of which is directed to the cell walls of bacteria, simply cannot find the target to hit. Or simply put, because of the impermeability of bacterial cell walls, an antibiotic agent cannot cope with such bacterium. The use of antibiotics without doctor’s recommendation, when suspecting any infection and uncontrolled use of antibiotic drugs lead to the fact that bacteria are getting used to these antibiotics much faster. That is why the resistant strains spread so quickly. Today, people can find many facts, proving that an active use of antibiotics will inevitably lead to resistant bacteria strains. 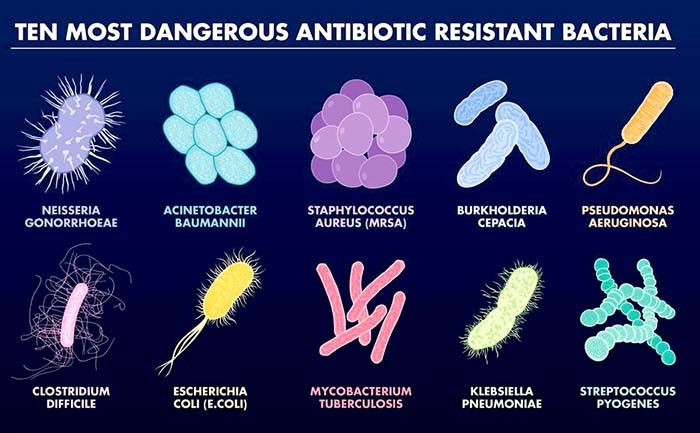 In addition to the occurrence of resistant bacteria strains, antibiotics overuse may cause quite unpleasant effects, such as: rash, vomiting, indigestion. Let’s face the fact: there are few drugs that cause no side effects.